Over the past year, multiple major media outlets and a powerful university president or two have been agitating about the correlation between parents’ income and SAT scores. Over that same time period, editors of various psychology journals were rejecting my regression study to determine the true influence of parents’ income on SAT scores while controlling for other possible factors because the study did not “make clear what the gap or problem is in the literature and exactly how the present study fills that gap.” If I cannot convince a journal that a lack of an examination on the influence of socioeconomic status in the entire 87-year history of America’s most important academic test is a gap in the literature, then what hope remains for my other project on the interplay of body-mass index and perspiration on navel lint accumulation? Part of the problem resulted from my need to rely heavily on years of state averages, rather than the scores of individual students, but I am convinced that anyone who manages to gain access to individual data will merely corroborate my work at much greater expense. One editor conceded, “I agree that there is something we can learn from these data,” despite rejecting my work anyway. Ultimately, the new open-access journal, Open Differential Psychology published the study. 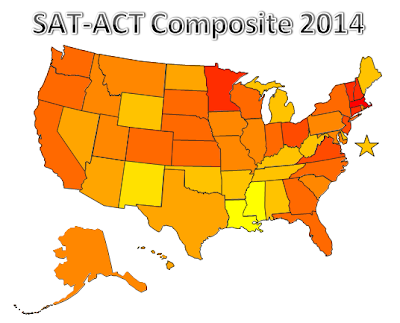 Last week, the College Board released the latest year’s SAT results. The organization cleverly released its “benchmarks” report the day before their usual, more detailed report. Reporters were too lazy to report on the subject two days in a row, let alone do any analysis. Blasé headlines declared scores “flat,” as they would for any two-consecutive-year analysis. I found the numbers fascinating. They dovetail with my study and other previous writings and flesh out some trends the media missed. 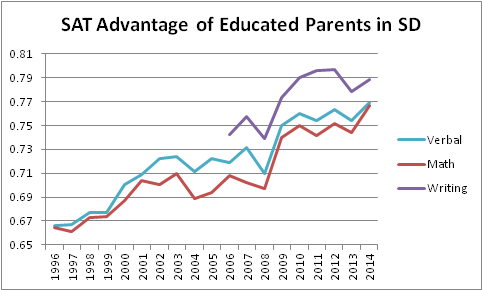 In my study I addressed the overlooked fact that correlations between parents’ education and (individual) SAT score and between parents’ income and SAT score have not been constant over time. 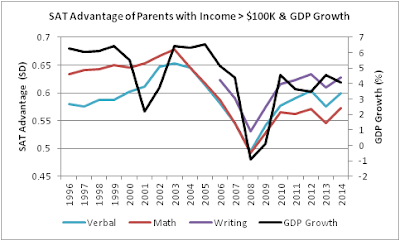 Family educational advantage seems to evince virtually undeviating growth as a predictor of SAT scores, but financial advantage seems to grow as the economy worsens. Rather than postulate that times of economic difficulty almost immediately make wealthy people smarter, one should focus on the exclusivity of the income category. 2014 brought new record advantages to students whose parents have bachelor’s or graduate degrees on the critical-reading and mathematics subtests. 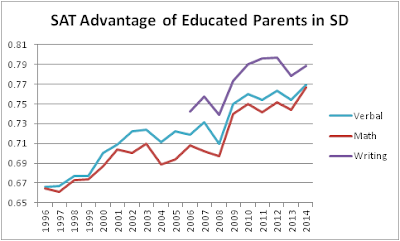 This fact can inform discussion about the notion of an “education bubble.” The expansion of college access has raised concerns over indebtedness, falling standards, and underemployment, but, while these concerns are likely to grow, education appears increasingly to benefit the following generation as if to demonstrate that the ability of higher education to sift and inculcate basic skills remains intact, or at least it did one generation ago. The difference between the yearly trends for the SAT-score benefit of education to a family compared to the benefit of coming from a home with a higher income startled me, especially given the sharp drop in income advantage coinciding with the 2008 economic downturn. So, I graphed income’s SAT advantage with US gross domestic product (GDP) growth rate. The graphs almost perfectly coincide when the income divide compares families above $100,000 to those below that. My regression study included a control for year, but an even more detailed study of the influence of family income could benefit by controlling for the state of the economy, as I suggested in my concluding remarks. Perhaps additional or alternative variables could be identified. For instance, year was significant in some regression iterations but had small β values. Perhaps year is a proxy variable for other factors like the state of the economy. The isolation of the brightest from the rest of society is already extreme; the forces driving it are growing stronger rather than weaker. Of course, the economy of the 1990’s, when they wrote that, usually appeared to be growing stronger rather than weaker. I can imagine two mechanisms for economic contraction weeding out smart families from the upper class: circumstances cause the power elite to lose interest in the power of ideas, and some upstarts’ ideas were not that good from the start. I suspect both are at work. The first mechanism supports a leftist or Marxist vision of ensconced aristocracy holding the privileges of power and leisure. If recessions interspersed with periods of anemic growth are “the new normal,” then The Bell Curve was partly wrong, and economic populism should be of interest to the so-called cognitive elite. On the other hand, when bad ideas create bad economies, perhaps the cognitive elite receive their just desserts. 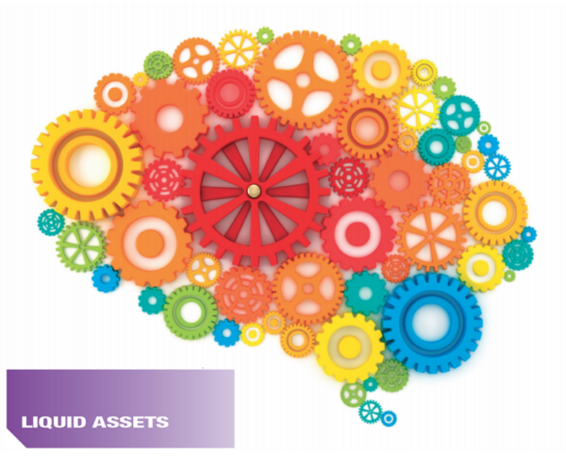 Some people who are obsessed with IQ research engage in some paradoxically simplistic thinking. As anyone who has surveyed the differential psychology literature about liberals versus conservatives or even the results for the SAT Student Descriptive Questionnaire can attest, the best indicator of dimness is indifference. Wrong ideas also sometimes require intelligent formulation. Spectacularly wrong ideas receive their negative appraisal in retrospect because they were compelling enough to do damage. Moreover, misbegotten hype might serve as a more commonly available vehicle of upward mobility for smart upstarts than truly transformative ideas. Wisdom and top-down analytic ability sadly receive fewer lauds than the clichés “street smarts” and “common sense.” To illustrate the distinctiveness of wisdom from intelligence so as to support the notion that smart people might promote unwise ideas, I would like to analogize with my personal experience working with engineers and doctors. Many of the engineers whom I have known work hard on mundane projects but like to engage in fascinating discussions about politics, metaphysics, and, of course, the possibility of alien life forms. They contrast with neurologists and neurosurgeons whom I have met who regularly work with cases of alexia without agraphia and amygdalectomy but remain willfully indifferent to any profound questions these phenomena raise about the soul or free will. If emphasis on analytic ability (as opposed to memory) is analogous to “wisdom,” then the engineers are the aristocrats in this analogy, although engineers often zealously advocate for their upstart ideas. I think most people assume that doctors are smarter than engineers because becoming a doctor is harder and better reimbursed, but I would say engineers are deeper conversationalists, which manifests a certain type of wisdom to me. Though the 90’s are long gone, Bill Clinton might still point out that this is not “midnight in America.” The American economy usually does expand, and smart people disproportionately tend to be the proverbial movers and shakers. Hints of this appear as evidence for their geographical mobility based on yearly maps of SAT and ACT data. 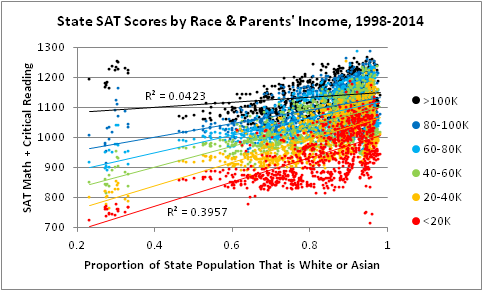 Racial demographics also relate to test scores and have their own trends of time and place. Before revealing the map that demonstrates this, I shall review the latest SAT and ACT data by race. 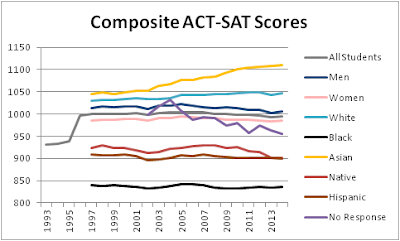 Composite ACT-SAT scores by race are very similar to the year before. Native-American scores remain just slightly above those of Hispanic Americans after a significant drop in Native-American ACT scores from 2010 to 2013. 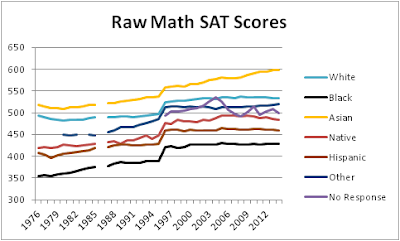 Overall, Asian scores have continued their amazing progress. The Asian SAT mathematics subtest advantage over whites rose to 64 points. 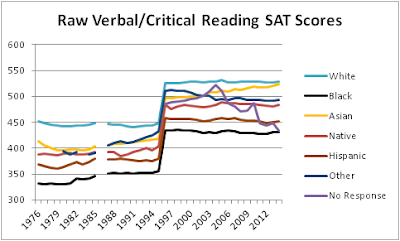 Asians are not closer to surpassing whites on the critical-reading subtest only because white scores rose by the same amount this year. 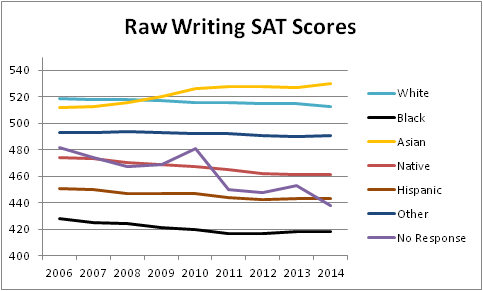 In contrast to all other groups, Asian SAT writing subtest scores rose in seven of the past nine years. 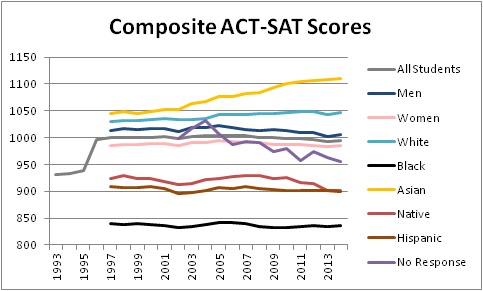 However, Asian progress on the ACT did appear to stop. Their scores on the reading and math subtests even slightly dropped. 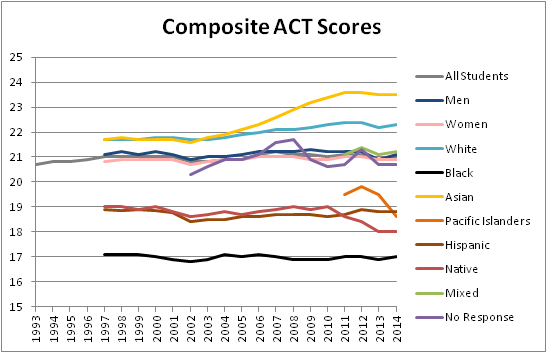 The average score drop for Pacific Islanders, for whom scores are available only in recent ACT data, was quite severe this year: almost a full composite ACT point. Fortunately for Pacific Islanders, this probably only resulted from a massive, 19-percent increase in ACT participation. Hawaiian students, who were 83 percent Asian-American, according to SAT numbers, bumped up their ACT participation from 40 percent to 90 percent, while their SAT participation rate barely budged at 63 percent. Asian students have been the one racial group who heavily favor taking the SAT rather than the ACT. This is likely due in large measure to foreign students. 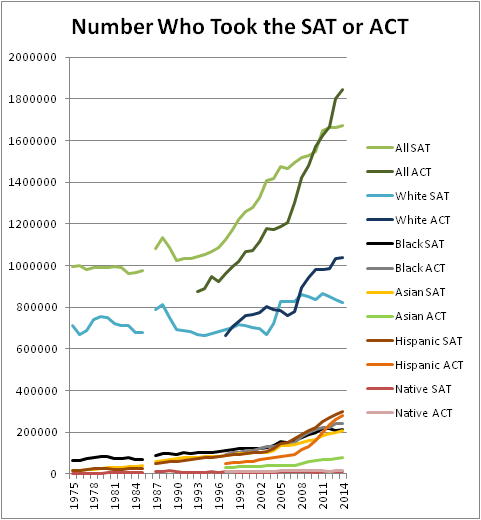 As the following graph shows, ACT participation surpassed that of the SAT, driven mostly by white students. 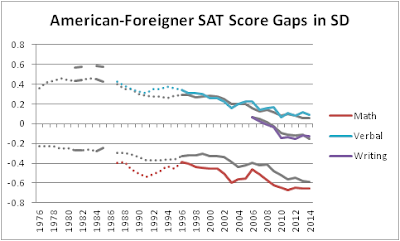 It would be tempting to surmise that foreign students are causing the continued progress of Asians on the SAT, but, as I previously discussed, the scores of foreign students (represented on the following graph as colored lines of a negative advantage for American students) still closely resemble Asian SAT scores (represented as gray lines for a negative white advantage), while the number of foreign students could not overwhelm the number of Asian students. Indeed, Asian progress has been so impressive that it calls into question some assumptions of experts in differential psychology and adherents to the philosophy behind so-called “human biodiversity.” Rather than reveal a unitary Asian-white general intelligence gap, Asians have always had a large mathematics advantage. Rather than maintain a constant mathematics gap as Asians improve their English skills, Asian mathematics, reading, and writing skills improved in tandem. Rather than have SAT scores that coincide with research on the secular IQ gains, known as the Flynn effect, Asian SAT gains have been large at the same time as their IQ gains have been small, and white SAT gains have been small, as large IQ gains in Western societies have continued unabated. 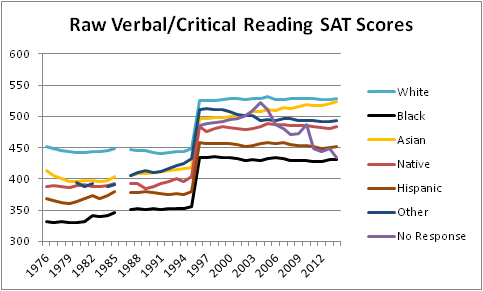 Frey and Detterman famously called the SAT an IQ test in 2004, but they offered no explanation for why their IQ-estimation equation essentially eliminated the reading subtest. Murray recently defended The Bell Curve by pointing out how little the black-white test score gap has changed. So, what is the precise meaning of that, given that the Asian-white gap has changed so greatly? What should be clear from the preceding review of new data is that participation rates greatly matter. 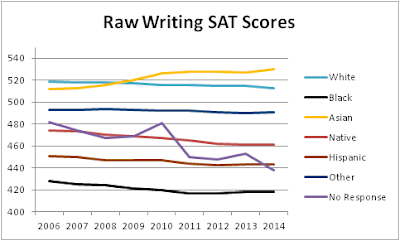 Hawaii’s ACT scores fell this year by almost two points on a scale from 11 to 36, following its participation increase. 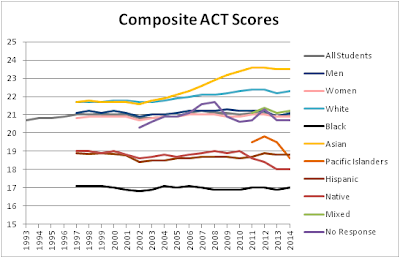 In order to appropriately map composite ACT-SAT scores, I must follow my previously described methodology for adjusting scores according to state SAT and ACT participation rates. Student diversity increased especially among coastal states. 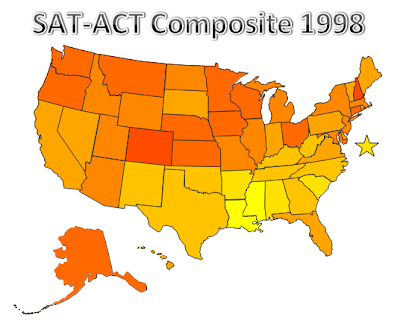 I previously claimed, “Demographic changes correspond to falling test scores, and one can see it, at least in terms of a North-South divide, on these maps.” The most recent years of this participation-controlled composite SAT-ACT score map make me want to amend that assessment. One can more easily notice the change by just looking at the oldest and newest maps without animation. The earliest year does suggest a North-South divide, but the coastal states of California, Georgia, South Carolina, and North Carolina improved, while some Mountain states declined. The trend could be a fluke, and a few states buck the trend, but it fits with my previous explanation of diverse states attracting relatively well scoring students from wealthy families. The upper class wishes to live near beaches and in high-status states with impressive cultural and educational institutions. Many of the cognitive elite actually might like some kinds of racial diversity. Southern states like Louisiana have not improved, or, in the case of Mississippi, scores improved but were already extremely low. Perhaps the cognitive elite would be attracted to this Southern coast but find Southern culture too alienating, and maybe such a feeling of alienation from otherwise attractive settings makes liberal condescension slightly more understandable. In an era that made “big data” a catchphrase, the colossal data pool that describes the colossal sample who took these tests inspires elite news outlets to make bar graphs of simple correlations and reports of flat scores. I call that flat reporting. Critics of Nicholas Wade’s latest book, A Troublesome Inheritance, have tried their best to pull discussion away from science and into the fluffy philosophy of racial semantics. They figure that if discussion never escapes the bog of racial constructivism, then no need exists for consideration of anything specific that would threaten or offend the modern paradigm. Wade deserves credit for effectively anticipating the critics’ points and blame for entertaining the critics’ points. However, Wade interrupted anthropological meanderings about the lack of perfect racial boundaries by introducing the subject of the warrior gene, monoamine oxidase A (MAOA). This is a specific gene with allele frequencies in a specific promoter sequence that differ tremendously by race. Science reporter Fiona MacRae conveyed her alarm with the headline, “Author: Africans prone to violence.” The body of her article offered no attempt to dispatch with the inconvenient gene, but I have collected all such attempts to put on display right here. An unremarkable dismissal presumably became a centerpiece due to its placement in the pages of Wade’s employer, The New York Times. Science writer David Dobbs provided glib assurance. He tells, for instance, of specific gene variants that reputedly create less trust and more violence in African-Americans and, he says, explain their resistance to modern economic institutions and practices. Alas, the scientific literature he draws on is so uneven and disputed that many geneticists dismiss it outright. One recurring motif of MAOA skeptics is stealing tactics from global-warming skeptics. After all, Dobbs is only a journalist. One must not expect him to conduct a thorough survey or even read a meta-analysis of 31 published studies on the gene. One should simply trust that the “many geneticists” he had in mind have some grasp of the evidence. Many—143 to be exact—population geneticists published a five-sentence letter in The New York Times Book Review. The brief letter explicitly thanked Dobbs and falsely accused Wade of claiming that natural selection “led to worldwide differences in IQ test results.” Columbia University biologist Molly Przeworski was one of the five geneticists who authored the letter. She told a Canadian radio program, “We just don’t have any of the types of genetic variants that are associated with societal or social or behavioral changes that he’s speculating about.” So, not only do population geneticists object to Wade’s book and dismiss outright the scientific literature for MAOA, but they also categorically rule out having any knowledge of any behavioral genes. (I presume that she did not mean that no human has genes that influence behavior.) Ironically, Przeworski also wrote a study with two other signatories to the letter, Yoav Gilad and Karl Skorecki, that contributed to the outright dismissed MAOA scientific literature. Wade cited their study to suggest that natural selection had acted upon this gene. However, that is not a study of a behavioral phenotype. In fact, I did not recognize any names on the letter as having contributed to behavioral research on MAOA. Certainly none of the authors of the two studies on the MAOA-2R allele that Wade singled out (and pointed out was about fifty times more common in African-American men) signed the letter. Contrary to popular perceptions, geneticists are not the leading experts on behavioral genetics. I have been tabulating the academic backgrounds of authors of MAOA research studies. Out of 76 studies, 67 percent had psychiatrist authors. Only 43 percent of studies had a geneticist author. 20 percent had neuroscientist authors, and 18 percent had psychologist authors. One author, criminologist Kevin Beaver, writes on the subject of biosocial criminology. No one writes about “biosocial psychiatry” because the transition from Freudian psychotherapy to the management of psychotropic drugs has been nearly uniform. Psychiatrists understand that some behaviors reveal mental illnesses, and targeting the relevant neurotransmitters, as the MAOA enzyme does, can save lives. Indeed, criticism of MAOA research does extend to criticism of the relationship between neurotransmitters and behavior, which some scientists openly mock. Another letter signatory, University of Pennsylvania geneticist Sarah Tishkoff, seemed to be working from the same script as Przeworski when she told science reporter Ewen Callaway, “We don’t have any strong candidates for playing a role in behaviour.” I wonder what standard of evidence Tishkoff awaits. Besides the aforementioned 31-study meta-analysis by Ficks and Waldman, a 27-study meta-analysis by Byrd and Manuck confirmed that MAOA has a powerful effect on antisocial behavior when coupled with childhood maltreatment. 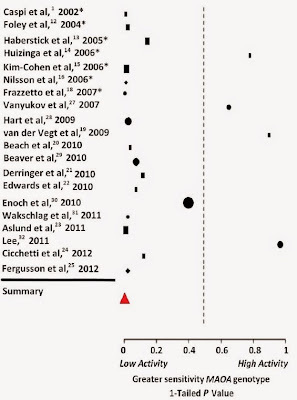 Both meta-analyses determined that the research did not show evidence of publication bias. This forest plot from the study just screams the words “uneven” and “disputed,” does it not? University of North Carolina biologist Joseph Graves, Jr. signed the letter and reviewed Wade’s book, saying “Similar just-so-stories appear throughout the text including his discussion of the MAO-A gene and aggression.” A “just-so story” is supposed to be unverifiable and unfalsifiable. Research on MAOA has verified its effect on behavior. If the evidence had failed to show an effect on behavior, it would have falsified the hypothesized role of MAOA. MAOA research has many facets, such as the purported stronger effect of MAOA-2R on violence than MAOA-4R or even MAOA-3R. Some facets are supported by evidence but not adequately replicated in multiple samples. The unwillingness of scientists to further replicate the effect of MAOA-2R since its discovery in 2008 or the interaction effect of MAOA-3R with low IQ in no way makes those findings legitimately unfalsifiable. Labeling scientific claims as “just-so stories” is a convenient way to dismiss scientific evidence without offering alternative hypotheses or evidence and has been used to describe the theory of evolution and global warming. Harvard geneticist Daniel MacArthur diligently covered all of his bases. He signed the letter and put out clear statements both for (“[T]he evidence for an association between the [MAOA] VNTR variant and antisocial behavior is substantially more consistent than most of these associations. This may well be one of the rare cases of genuine associations.”) and against (“By historical analogy, most if not all of this [MAOA] literature is wrong and will soon be forgotten.”) the conclusions of MAOA research. Speaking of history, I wonder how perceptions of a connection between genetics research and reactionary ideas would impact genetics research funding. Though University of North Carolina anthropologist Jonathan Marks could not sign the geneticists’ letter, he did show them that flippant dismissal of MAOA science need not be so lacking in flowery finesse. Rather, he takes an enormous leap and speculates retrogressively that groups of people may simply differ in genes that affect personality and behavior. In his earlier book Before the Dawn (2007), Wade opined freely about the possible existence of ping-pong genes among the Chinese. Now he speculates about genetic propensities for violence among Africans, obedience in Chinese and capitalism in Jews. Mercifully, he stops short of inventing genes for basketball, laundry and stand-up comedy. I am sure that he meant no implied insult of Chinese people’s ping-pong skills. Unlike ping-pong, violence is universal not only to humans but also to the entire animal kingdom and portions of the plant kingdom. Though none of these people mentioned it, scientists discovered Brunner syndrome, which is marked by aggressive behavior apparently resulting from a completely nonfunctional MAOA gene, over twenty years ago. This lack of a functional MAOA gene also is present in some unusually aggressive mice. Scientists who attempted to interact with these MAOA-knockout mice found themselves in a real-life reenactment of Tom and Jerry. Science writer Meredith Knight similarly described the twenty years of replicating the influence of MAOA on aggressiveness as a new, fragile overreach. The scientific community largely agrees that Wade oversteps when making any claims about race, genetics and behavior, largely because evidence linking genetics and human behavior is so new and somewhat fragile. Even linking genes to major mental health disorders, like schizophrenia, is contentious. Relating genes to a more qualitative characteristic, like aggressiveness or social obedience seems rather an overreach. Lest one think only liberal academics and reporters volunteer such brief, zero-substance slights of MAOA science, Charles Murray claimed MAOA was a case in point of “tentative and often disputed” findings. Like the others, Murray’s brevity probably resulted from a lack of expertise that unfortunately did not accompany a more modest assertion. During Murray’s first public mention of Wade’s book (at the 45-minute mark), Harvard Professor of National Security and Military Affairs Stephen Peter Rosen brought up MAOA to Murray, confusing its gene-environment interaction with “epigenetics.” The environmental variable is measured in the environment, but that does not mean its mechanism of effect is nurture or epigenetics (which can also be influenced by genetics) rather than genetics. Reporter Robert VerBruggen questioned whether Wade’s treatment of MAOA and other research relating to race was “suitable for a book aimed at the general public.” Apparently attacking MAOA science is suitable for the popular press, so why would defending it not be? I do not think most violent racists think about MAOA allele frequencies. Just as climate-change science belongs in many public policy discussions, well-reasoned and respectful discussion of MAOA can appropriately inform some social-justice debates and courtroom deliberations. As Willamette University biologist Christopher Irwin Smith and author Alondra Oubré demonstrated, brief dismissals of MAOA research can make sense for a deluded scientist or writer because writing a lengthier composition will fill the Internet with more falsehoods and risk overspill. University of Maryland sociologist Philip Cohen wrote a somewhat lengthy critique, and it contains a number of mistakes, but perhaps these were honest mistakes. Wade devotes considerable attention to MAO-A, the gene that encodes the enzyme monoamine oxidase A, which is related to aggression. He singles out studies showing that a rare version of the gene is associated with violence in U.S. male adolescents. Out of 1,200 young men surveyed in the National Longitudinal Study of Adolescent Health, eleven particularly violent young men carried the 2R version of MAO-A, subsequently known as the “warrior gene.” Nine of those eleven were African American, comprising 5 percent of the black male adolescents in the study…. Now Wade is off and running. He has a gene variant that is more common (though still rare) among black men and is associated with elevated rates of violence. First, these basic facts need clarification. The National Longitudinal Study of Adolescent Health deliberately oversampled African Americans with college-educated parents. Mixed racial ancestry is common among African Americans, so allele frequencies that are higher among African Americans than whites are probably even higher still among West Africans. The National Longitudinal Study of Adolescent Health contained nine African-American men with MAOA-2R based on interviewer-assessed race and ten based on self-reported race, constituting 5.2 percent or 5.5 percent of the African-American men, respectively. The term “warrior gene” dates back to a 2004 Science article by Ann Gibbons and explicitly refers to MAOA-3R, the most common allele of this VNTR promoter as providing a predisposition to violence, compared to MAOA-4R, which is the allele most common in white people. So, the relationship between MAOA and violence is already well-established in a large collection of research for a version that is not rare in any group. This may be true. But it certainly overstates the strength of the case. Consider that, in the Adolescent Health data, black male adolescents were more than twice as likely as whites to report having committed an act of violence. If you found any gene that happened to be correlated with violence, chances are good it would also be correlated with race. Confirmation with more powerful genetic testing methods may strengthen this case in the future, but Wade’s inflated interpretation is not justified by the existing evidence. This suggests that Cohen did not understand an extremely important fact about Beaver et al. That study compared African-American men with MAOA-2R to African-American men without MAOA-2R. Sociological inequities for African Americans could not confound a study that only included African Americans. The amount of African ancestry could confound, but that could result from genetic associations rather than class associations, since the percentage of African ancestry and class are probably not perfectly correlated. Sometimes in genetics there is some gene or coding that produces some measureable effect, and that’s how most people seem to think about genetics most of the time – there is “a gene for” something. In the days before today’s genome-wide association (GWA) studies, before scientists had the means to investigate hundreds of thousands of genetic markers at a time, they often looked for effects of such “candidate” genes. This approach was valuable, especially when the role of specific genes was known (as in the case of the BRCA1 gene, associated with higher risk of breast cancer). However, with most diseases, and even more so with behavior, which is presumed to be more complicated than single-gene mechanisms, candidate gene studies were (are) often fishing expeditions, with a high risk of false-positive results, amplified by selective publication of positive findings. It is quite possible that’s at least part of what happened with MAO-A and aggression. Most studies about MAOA have been gene-environment interaction studies, where some version of MAOA has a statistical association with a behavior only in the presence of a particular social factor, such as a history of child abuse. No, they have not. Studies on the “main effect” of MAOA (the effect of MAOA on antisocial behavior without an interacting variable) began years earlier than the gene-environment interaction studies. The Ficks and Waldman meta-analysis of the main effect included 31 studies. 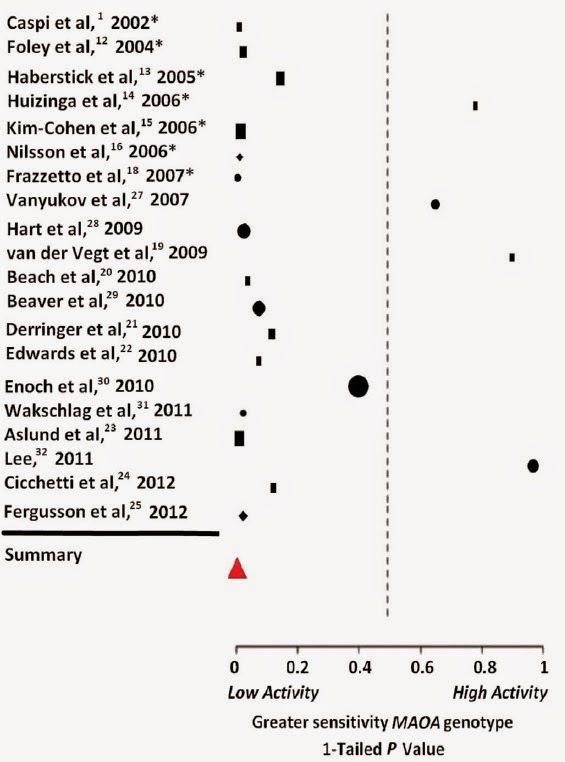 The Byrd and Manuck meta-analysis of the gene-environment interaction only included 20 studies for the analysis of men. First, that 2R version of MAO-A is very rare, and the two studies Wade cites about it … both used the same sample from Add Health – 11 boys with the variant. Two studies doesn’t mean two independent results. You could never get a drug approved based on that (I hope). Second, as far as I can tell there was no strong reason a priori to suspect that this 2R variant would be especially associated with violence. So that’s a caution. I have to say, as I did in the review, that it may be correct. But the evidence is not there (and you shouldn’t say “not there yet,” either). Those two studies are the entire evidentiary basis for Wade saying that genes that shape social behavior vary by race (“one behavioral gene … known to vary between races”.) I didn’t find any other studies that show MAO-A 2R varies by race (though maybe there are some). No, research established the effect of MAOA in alleles that are not rare. When the Food and Drug Administration approves a drug, doctors receive wide leeway to prescribe it off-label and at dosages they deem appropriate. So, why should MAOA-2R not constitute a higher dosage of “warrior gene”? The strong a priori reason to suspect that MAOA-2R is especially associated with violence is that the study by Guo et al that Cohen reviewed also included an in vitro analysis of gene expression, which showed much lower expression for MAOA-2R. Brunner syndrome shows the effect of having an MAOA gene with zero gene expression. There are two additional studies on MAOA-2R and aggression in the Add Health sample. (I also would like to see more research on this in other samples.) However, the list of studies that establish differing allele frequencies for MAOA-2R, MAOA-3R, and MAOA-4R by race is long, and I have been attempting to tabulate them in a convenient table. In fairness, even Wade’s treatment of MAOA research was good but not perfect. He repeatedly referred to MAOA-2R as “two promoters.” It is actually two repeats of a DNA sequence within a single promoter. The distinction is important because MAOA actually does have multiple other promoters, including one other found to affect antisocial behavior in women more than this one, and this relates to Wade’s attempt to downplay the importance of MAOA. Second, a large number of genes are evidently involved in controlling aggression, so even if African Americans are more likely to carry the violence-linked allele of MAO-A promoters than are Caucasians, Caucasians may carry the aggressive allele of other genes yet to be identified. Indeed a variant of a gene called HTR2B, an allele that predisposes carriers to impulsive and violent crimes when under the influence of alcohol, has been found in Finns. It is therefore impossible, by looking at single genes, to say on genetic grounds that one race is genetically more prone to violence than any other. Determining the relative importance of MAOA compared to all other violence genes poses a significant challenge, but scientists have not even determined the importance of MAOA to overall aggression heritability, yet. Perhaps the controversy surrounding MAOA research or Wade’s book could convince the National Institutes of Health to fund a very large, international study to attempt to replicate and fully quantify the effects of every MAOA allele for every single-nucleotide polymorphism and promoter, every gene-environment interaction, every gene-drug interaction, every gene-hormone interaction, every gene-gene interaction, and every epigenetic effect together in the same study. Clues do exist that this single gene deserves all of the attention that I have been giving it. The fact that MAOA research has discovered so many of these interaction effects could be evidence of the gene’s high importance. The other 2008 Guo et al study of MAOA-2R that Cohen did not review determined that the allele affected violent behavior more than two other candidate genes known for their effect on the neurotransmitter dopamine and that it had a large gene-environment interaction effect, as well. Brunner syndrome, itself, provides another clue. If MAOA is unimportant compared to unidentified functional alleles of other genes, why have scientists not discovered those through rare knockout polymorphisms? Wade is pointing out such a knockout polymorphism syndrome for HTR2B. Like Brunner syndrome, only a small number of known cases exist, and that study claimed it was “apparently exclusive to Finns,” 1.2 percent of whom have it. Seven cases of the HTR2B knockout allele did not induce violent behavior, whereas Brunner syndrome research uncovered only four cases of MAOA knockout allele without accompanying antisocial behavior in men. HTR2B is on chromosome 2, and MAOA is on the X chromosome. So, men with an MAOA knockout allele have no MAOA enzyme. Men with the HTR2B knockout allele still have some HTR2B function except the one homozygote, and 1.2 percent is not the true allele frequency; 0.68 percent is. The hemizygosity of X-chromosome genes could increase their importance for behavior and help explain why men tend to commit more violent crime than women. Alcohol use precipitated 94 percent of violent crimes among these men with the HTR2B knockout allele. Follow-up research looked for personality effects of other alleles of the gene and came to contradicting conclusions. Whatever evidentiary gaps exist should be taken to signify the need for more research, not an excuse for ignorant dismissals of the decades of existing research. I have good reason to interpret many of the listed errors and misjudgments as dishonest, politically motivated opposition to science. Oubré tried to pass off her work as a serious “reality check” for MAOA research. Her essay was full of careless errors, including completely wrong numbers taken from Wikipedia vandalism and attributed to the National Longitudinal Study of Adolescent Health. When I corrected the errors, her reply was complete denial (“I did not use Wikipedia for this article. Cheers.”), followed by admission with hysterical defensiveness against my unrealistic demand for correctness (“You imply that I should have a wider grasp of the literature on the MAOA gene, as though I am obligated to make this my raison d’etre…. Am I entitled to even have a life?”). When I suggested that the essay was a criticism of Wade’s book because she cited his book in a critical way, she responded that she had not even read it. Her editor’s response to me was initial denial, continued refusal to make a correction, and the statement, “I see not taking others seriously is your modus operandi.” Well, it is not simply a matter of an inability to take Alondra Oubré seriously. I am actually wondering whether anyone should take seriously anthropologists, sociologists, biologists, or population geneticists.